UPDATE: The Kindle Fire, at $199, appears to offer a very similar interface as the tablet described below, and it doesn’t require any hacking. It’s set to be released November 15, 2011.
iPads have already been heralded as the personal computers of the future. (With the rise of cloud computing and web 2.0 software, I have to agree.) I work with several teachers who already have iPads in their classrooms, and the devices really can help students learn. But at $400-$830, most schools can’t afford to get iPads for every teacher, much less for every student. And even current iPad competitors, like the Motorola Xoom, are priced at around $500 – $800. The basic idea was that you could download hundreds of books on this little tablet and access them wherever you happened to be. Now, in order to download books, the Nook Color had to be able to connect to the internet, so it has wifi capabilities. To create a user-friendly interface, the Nook’s developers built it on an operating system very similar to the one used by Android phones and Android tablets (like the Motorola Xoom). However, they didn’t give the Nook Color the same capabilities as an Android phone or tablet — they just built up the e-reader function. Once the Nook Color went on the market, though, some ingenious computer programmers figured out that with just a few tweaks, users could add all the features one would find on an Android tablet. All you have to do is “root” your Nook Color. “Root” is the term used for the admin user on a linux operating system, like Android. If you’ve ever tried to install programs on a work computer, you might understand what this means — the “admin” user on most computers is the only person who can make drastic changes to the operating system, like installing new programs. Well, for the Android, the “root” user is the only person with these powers. Out of the box, the Nook Color doesn’t give its buyer this “root” access. But if you download and install a small piece of software on the Nook, you can “root” it and, thus, get administrative privileges to make all the changes you’d like. The best part is that you don’t lose your Nook Color. You can still use it as an e-reader. But you can use it for a lot more, too. The Nook doesn’t have any built-in cameras, which I see as the largest benefit of having an iPad 2 in the classroom. The Nook is smaller than other tablets, so it can easily fit in an adult-sized hand. This can be great for traveling and for kids with little hands, but it might be a con for some. The Nook has a slot for SD cards, so you can add memory easily — as much as 32GB on top of the default 8GB. The Nook is only available with wifi. As long as you have wireless service in range, you can get internet access. But you can’t get a 3G/4G data plan with Verizon or AT&T for your Nook (although I’m using mine with a Verizon mobile hotspot, which allows up to 5 devices to connect to the internet anywhere a phone could for $35 a month). You can connect the Nook to any computer using an included USB cord, so you can transfer photos, video, and other files fairly easily. The Nook doesn’t have a built-in microphone, so you’d have to use a Bluetooth mic for voice recording. Your micro SD card is what will increase your Nook’s memory from the built-in 8GB. You can get a 4GB micro SD card for as little as $5 and a 32GB card for about $50. I went with a 16GB card, which is around $20 online. The micro SD card adapter allows you to plug the card into your computer so you can transfer files from your computer onto your Nook (like a flash drive), which you will have to do to root your Nook. If you have a more recent laptop, you’ll probably see an SD card slot in the side, so you’ll want a flat card-like adapter. If you don’t have an SD card slot, you’ll want to get a USB adapter. Jim’s Soft Keys directions were a little off for my new Nook, too. To find the “Run Service” button to uncheck, you need to open Extras > Soft Keys > Tools (button next to magnifying glass) > Softkeys Service. To get from there to the “Physical Home Button” Menu, click the backwards arrow icon at the bottom of the screen (to the right of the open book icon) > Physical Home Button > Home Button. Also, I’d suggest you follow Jim’s directions under “A note about the Nook Color’s built in launcher (Extras),” which explain how to install and set up the Advanced Task Killer. However, after I went through the install process, I changed the security setting back to “high.” Why? This version of Android doesn’t automatically close apps, and there’s no easy way to close most of them unless you turn off your Nook. This is how all Android devices work — the idea is that apps will stay open to easily re-boot unless more memory is needed, and then Android will automatically close them. This is nice if you want to, say, listen to a music app while you’re browsing the Internet. Still, it means you could have all your apps running at once, even when you’re not using them, which annoys some people (including me). The Task Killer allows you close any open apps. You can start up Task Killer (it’s the green android guy in the bottom left corner of your screen) and it will show you all the open apps. If your security settings are on “high,” it’ll only show you the apps, and you can just click “kill all” to close everything at once (the “low” security setting shows you everything that’s running, including operating system stuff). Now, you should have a high-functioning rooted Nook. Woo hoo! After following those directions, you’ll notice that your Nook still looks and acts primarily like an e-reader. To access the Android apps and other tablet functions, you have to enter the Nook’s “extras” menu. Because I’m using my Nook primarily as an Android tablet and only secondarily as an e-reader, I wanted to change its look and feel. In other words, I wanted my Nook to look like an iPad. It turns out, it wasn’t too difficult. 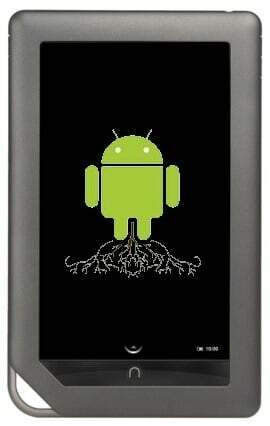 Click here for a list of other Android apps that work well on rooted Nooks. With a few apps, you may notice that things don’t look quite right on the Nook — they work fine. They just don’t seem to utilize the screen space of the Nook. The reason is because the Android OS you installed is Android 2.3, which was created to be used on phones. The new Android 3.0 (known as “Honeycomb”) was recently released and is designed specifically for tablets, so the interface looks great on the Nook. You can install it on your Nook, but it takes quite a few extra steps that are fairly tech-heavy. I’m betting that a one-click install of Honeycomb, like the one for Android 2.3, will be available for the Nook in the next 6 months. But if you’ve got the courage and the patience to try, this post will point you to this thread, which lets you install Honeycomb fairly easily. From there, the tricky part is getting the Market and Google apps to work. For that, you need to follow these programming steps. I’ve been testing my Nook pretty hard in the week since I rooted it, and I haven’t had any problems at all. However, if you’re having issues (or want more info), there are a lot of places to turn for help. There’s a large (and growing) community of rooted Nook users out there, so Googling your problem along with the phrase “rooted Nook” will probably get you to some relevant pages. Also, the website nookDevs offers a wiki and a list of forums filled with information about the rooted Nook. Cool… But Is It Legal? I’ve researched the legality of rooting a Nook, and I can’t find anything saying it’s illegal. But I’m guessing if it was illegal, that would be common knowledge by now (Nook rooting became really popular just before Christmas last year). Also, in reading the licensing agreements, it appears that users can do whatever they’d like with the Nook once they purchase it. But they can’t hack into the Barnes & Noble software and mess around with the code. (Rooting a Nook doesn’t do that — it’s similar to adding an additional piece of software to your computer. You’re not changing what’s already there. You’re just adding to it.) However, rooting a Nook does void your warranty. So you probably don’t want to buy the added 2-year warranty option. Still, if you’re planning to use rooted Nooks school-wide, it would be a good idea to have your district’s legal department okay the move. Use the Nook to track student progress. When I taught 6th grade, I made an Excel sheet that listed all of my weekly objectives as the column headings and all my students’ names as row headings. Then, I printed it out (a separate page for each class) and put it on a clipboard. I would walk around during labs taking brief notes about how students were progressing toward the standard. It was great in theory, but it was really difficult to go back to these pages and use them to inform my grading, parent meetings, or future instruction. With a tablet, though, you could create a file like this as a Google docs spreadsheet. Then, you could create a code (1 if a student exhibits the skill during lab, 2 if they show it during class discussion, 3 if they use it during a test) for quick note taking and easy data analysis. The Nook would be easy to carry around and write on briefly and, with everything stored electronically, it would be easier to analyze the data to inform your instruction or grading. Use the Nook in small groups. When leading a reading group or speaking with a small group of students, new vocabulary often comes up. Tablets are perfect for quickly finding a photo or video to explain a new concept. With visuals and audio, students are more likely to understand and remember the content. Use the Nook as a center. Just as you can use computers as a center that students rotate through, you can use a tablet for the same purpose. Two students can work on a tablet to complete an activity and then pass it to the next pair. Use the Nook to model problem-solving. I once knew a science teacher whose motto was, “I don’t know, but let’s find out.” Whenever students asked him a question he couldn’t answer (and sometimes even a question he could answer), he would say, “I don’t know, but let’s find out,” and then lead the student to find the solution. A tablet can definitely help in this process. How many times have you wondered something and pulled out your smart phone to look up the answer? You can do the same with a tablet, but it’s large enough that several students can see what you’re doing at once. Read on for ways students can use the Nook, either in centers or one-to-one. Obviously, one of the best applications of a rooted Nook Color is that students can easily access the internet and all gaming, interactive, and web 2.0 sites available there. But Android apps also allow for further learning. And there are a TON out there. Below, I highlight just the few I’ve found in the past week. If you’ve got other suggestions, please leave a comment! Objective: The student will be able to follow programming directions in order to build an Android app. Have students reflect on things they’ve learned in the previous year (you can focus on one class, or let them choose from any class). Tell them they will create an app to help teach one objective to students who will take the same class next year. Challenge each student to create an app that will both engage students and help them better understand the content. Have students build apps using Google’s FREE App Inventor, which allows students to create apps for Android devices. Even simple apps can go a long way if they’re built creatively. This is a great opportunity for students to create apps that help explain major concepts like evolution or even climate change. This is a great way to help teachers get ideas to get started. One way that teachers could have a budget to buy a Nook color for their classroom is to ask for gift cards from the parents. A lot of parents want to contribute to the classroom. Instead of buying things the teacher may not like or use they would probably more than happy to give a gift card from Barnes & Noble in any amount. I love the gift card idea, Maureen! Thanks for sharing.